Slacker Radio for Mango demoed on video! If you’re a T-Mobile user and you are running the Mango beta, you should now be able to update Slacker Radio and take advantage of the background streaming, instant resuming, live-tile pinning, and volume media control features! It looks like users of other phone networks may be out of luck for now (this app is published by T-Mobile USA after all). However, if you can’t get your hands on it, check out the video above demoing how Slacker Radio runs on a HTC HD7 Mango device! Background streaming works just as you would expect. You can finally stream songs while responding to a text message or doing anything else. You can also pause or skip a song using the volume media controls, just like in Zune. 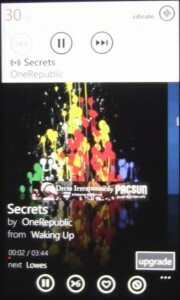 Another new feature is the ability to pin a Slacker station right to your Windows Phone homescreen. Then, you can click that tile and instantly start that station without first navigating through the Slacker app. The app also can instantly resume, so you don’t have to sit around waiting for the screen to reload every single time. All of these new features are great, but unfortunately the Slacker app is full of bugs at the moment. One bug I experienced was the inability to play Slacker radio over my Bluetooth speakers in my car; the audio slowed down to a super-slow-mo version and didn’t play normal. The interface is also very laggy, and doing some things like clicking on the song title in the volume media controls can mess up your current song for some reason. Pinning a station to the homescreen also doesn’t work half the time, since when you click the tile, it either doesn’t do anything, or just opens Slacker most of the time! And, if you’re driving around while listening to Slacker and you drive from a 3G to an Edge zone, the app freezes the music and doesn’t automatically keep playing, even though if you click Pause then Play, it plays fine. It’s great to see that the developers of Slacker added all of these unique Mango features already, but the app definitely needs work! Hopefully Pandora will release an app soon (since they were complaining about the lack of background music previously). Nevertheless, background music streaming is a highly needed feature, and it’s great to see it in action!